BOB LAZAR - Physicist or Fraud? Video of UFO over Area 51, allegedly taken by Bob Lazar in March 1989. Without doubt Bob Lazar is one of the most controversial personalities ever to have been involved in Ufology. A number of experienced and eminent Ufologists are of the opinion that he is an absolute (but highly intelligent) fraudster, whilst others do regard his claims seriously. Love him or hate him, Bob Lazar has certainly made a major impact in the world of Ufology, especially with his claims to have worked as a physicist at Area 51, involving the reverse engineering of UFOs. Here follows a description of Bob Lazar’s experiences, based predominantly on his own words. On the 28th June 1982 the Los Alamos Monitor announced " L.A. man joins jet set". This headline referred to a young physicist of the Los Alamos Meson Laboratory who had built a 200 m.p.h. jet car [ right ] in his spare time. This young man was Bob Lazar . Only the elite of scientists gained employment at the Meson Laboratories - originally where the " A bomb" was developed and where top secret projects are carried out. Whilst at the laboratories Lazar attended a lecture given by Professor Edward Teller - so called father of the "H bomb". At a chance meeting Teller showed a lot of interest in Lazars jet car and the two men got on well together. Teller told Lazar to get in touch if he ever needed help - particularly regarding a job.6 years later , after many trials and tribulations (including the untimely death of his wife) Lazar moved to Las Vegas and wanted to work in a scientific situation. After contacting Teller, Lazar quickly received a phone call asking him to attend an interview in the E.C.&G. building - E.C.&G. being a massive company involved in research projects for N.A.S.A. This lead to Lazar being offered a job working on a "field propulsion system" at the Nevada Test Range - which includes Area 51 . Video of UFO over Area 51 allegedly obtained by Bob Lazar. Bob Lazar talks about the briefing documents he was given to read. Bob Lazar describes the "Sports Model" UFO he came across at Area 51. On his first day at Area 51 Lazar was amazed at the incredibly levels of security - 22 scientists were covered by 70 armed guards and the " camouflaged inter-connecting hangars". His identity badge bore the contract number E-67223MAJ and the inscription "DEPARTMENT OF NAVAL INTELLIGENCE". Lazars boss - Dennis Moriani - had MAJESTIC on his badge. During his first day Lazar was given 120 blue files to read which dealt with UFOs and extraterrestrials. Although they were superficial the contents shocked him - "I could not believe it - I was fascinated"
The reports made it clear that the U.S. Government were in possession of a number of extraterrestrial craft and that au topsies had been carried out on some of the occupants. Lazar was then introduced to his job - the propulsion techniques of the craft and the possibility of inter-stellar travel. On his second visit to Area S4 - an area within Area 51 - Lazar was taken into a hangar and shown a disc shaped craft - "it was absolutely smooth, about 40 feet wide and appeared to have been made in one piece". Lazars job was to investigate the construction and operation of its propulsion system - in order to "back engineer it". Jim Tagliani , a former engineer of the Stealth Project , remembered working with Lazar and was in no doubt he had attended Cal-Tech. Also, Knapp found 3 employees of Meson Laborato ries who all recalled Lazar - no person works there without the highest of qualifications. Despite all of this Lazar was officially discredited after installing a computer/security system in a building which proved to house an illegal brothel. Whilst in court the prosecution admitted that Lazar was hardly a typical criminal and had a spotless record. He was put on probation for 3 years and also worked for 150 hours lecturing in physics to children . Lazar was to remark - " I should have seen it coming". A Russian satellite photo of a circular object at Area 51. The internal telephone directory of the Los Alamos Laboratories. ( an institution of high repute) - Bob Lazar's name is listed. Lazar's Tax Statement for 1989. Video of UFO reputedly filmed by military camera and smuggled out of Area 51. The object was seen to cover 13 miles in 6 seconds. With security so tight at Area 51 it is unlikely any employee, whether physicist or cleaning service worker, will ever know the truth about all the work being done there. BOB LAZAR - True Or False? Glenn Campbell - devoted many years to the investigation of UFOs, especially relating to Area 51. - Glenn Campbell discusses Bob Lazar and UFOs. For many years Glen Campbell devoted his life to the study of UFOs and was acknowledged as the “expert” on all things relating to Area 51. I am happily retired from the Area 51 field and am currently enjoying a blissfully UFO-free lifestyle, but one issue won't leave me alone: People keep asking me about Bob Lazar. True or False: Did he work with flying saucers at "Area S-4"? I adore ambiguity, and I really hate being pinned down like this. I mean, what is truth anyway? My idle-handed colleagues and I have been researching Lazar's claims since 1992, but I wasn't there when Lazar first made those claims, and no one can visit the secure military areas where Lazar's experiences supposedly took place. Who am I to declare what is and is not reality? Still the inquiries keep coming, especially after Lazar's recent reappearance on Art Bell (June 6, 2002), where he announced yet another movie deal. The only way to efficiently deal with my questioners is to come up with a crude one-word answer. Unfortunately, that answer is False. I don't mean this as an insult to Mr. Lazar. He's an incredibly creative and intelligent guy. I also don't mean to denigrate Lazar's many supporters. One thing I learned while studying Area 51 is that you don't mess with people's religion. Lazar, I believe, has a right to make his claims, and people have a right to believe him. Lazar's flying saucers have become part of Nevada's identity, and probably even my own. I mean "False" only in a rather mundane factual sense. Lazar did not work with flying saucers in an underground hangar near Papoose Lake. He made the story up. Furthermore, he made it up by himself, without the help of any nefarious agency and probably without any deep motivation other than the pleasure of attracting attention and putting people on. The story evolved out of a long heritage of pre-existing underground alien base claims, which eventually infected the pilot and conspiracy theorist John Lear. Lear announced, in electronic bulletin board posts in the 1980s, that gray aliens were eating humans in deep underground facilities at Area 51. Lazar met Lear, heard his ramblings, and decided to give Lear what he wanted. Lazar took Lear's paranoid delusions and repackaged them in a much more intelligent and internally consistent rendition. Initially, Lear was the only audience, but he tipped off a Las Vegas TV station, and the frenzy began. The story soon spun out of Lazar's control, and, at least until the recent Art Bell appearance, Lazar seemed to sincerely want it to go away. Lazar's limited knowledge of Area 51 came from secondhand sources, which are plentiful in Las Vegas. Lazar has never been to Area 51. His "S-4" is a relocated and reconfigured version of "Site 4", a real Top Secret radar testing facility west of Area 51. 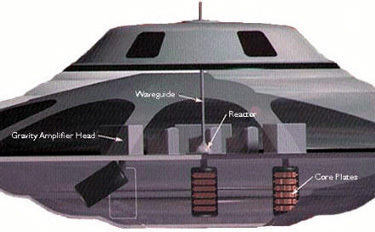 Lazar's saucers and their propulsion system seem plausible to anyone without a physics degree. They were constructed, in Lazar's head, with the same fastidious care that he has lavished on his real-life fireworks, jet cars and other mechanical projects. "Element 115" and its peculiar periodic neighbors were discussed in an article in Scientific American just before Lazar used it to fuel his craft. Lazar has always displayed an exceptional respect for detail and consistency, and he has an extraordinary ability to focus his attention on whatever his current project is, to the exclusion of everything else. His only deficiencies are moral (that is, if you consider lies and the exploitation of others to be somehow 'wrong'). A good model for how Lazar operates is found in the forger Mark Hoffman, now in prison for murder. While forging Mormon documents, Hoffman built a detailed web of lies that still leaves researchers in awe. Hoffman's forgeries were internally consistent and perfect in every detail, and they meshed seamlessly with the world of existing documents, many of which he also created. His trance-like ability to focus his attention was so highly developed that he easily fooled polygraph tests. Lazar is in the same league, having convinced a hypnotherapist of his truthfulness and earned at least an "inconclusive" polygraph report. Lazar might be even more clever than Hoffman, because he hasn't significantly broken the law, and he strictly limits his claims to his original story. You can ask me for proof for my Lazar position, but I'm not going to play the game anymore. The Lazar documentation on the internet is already massive, and the heated debates about one detail or another of Lazar's claims have been going on for over a decade. It is senseless to harp on his false educational credentials, enhanced employment claims or pandering conviction. Those who believe in Lazar are going to continue believing, and those who don't will only say, "I told you so." The funny thing about oral traditions like this is that they continue to live and propagate regardless of the evidence and far beyond their original source. They spawn new stories, like the similar UFO claims of Bill Uhouse, aka "Jarod 2" (which is another fascinating personal journey). Lazar's story has grown much bigger than Lazar himself, and no one will ever be able to follow all of its threads. Answering "False" still rubs me the wrong way. I distain finality, and I certainly don't want to attract the attention Lazar's rabid supporters. Instead, I would rather state things in relative terms: Lazar's claims _could_ be true, like the boy crying wolf who eventually encounters a real one, but given the known lies and lack of new information, the joy of exploring the story has dwindled. Life is full of more interesting mysteries. Have Scientists Just Proven Bob Lazar Right On Alien Antigravity systems? In 1989, Robert Scott Lazar claimed to have worked as a physicist at a hidden base referred to as S4 on a highly classified project involving back engineering of alien technology, antigravity and antimatter propulsion. Stanton Friedman doesn't believe him. But have scientists just proven Lazar was right all along? RNU.com - (Raiders News Update) - Yesterday, in the article, "How to float like a stone", science correspondent for The Guardian, David Adam wrote that what goes up no longer has to come down. Quoting researchers who announced their results this week in the New Journal of Physics, Adams noted that, "British scientists have developed an antigravity machine that can float heavy stones, coins and lumps of metal in mid-air. Based around a powerful magnet, the device levitates objects in a similar way to how a maglev train runs above its tracks." claims to have worked on whilst at Area 51. The article went on to quote Peter King, physics professor at Nottingham University, as saying, "We can take an object and float it in mid-air because the magnetic forces on the object are enough to balance gravity." The device evidently exploits diamagnetism by placing non-magnetic objects inside a strong magnetic field where they are forced to act like weak magnets themselves. A field is created that is stronger below and weaker above. The resulting upward magnetic force cancels out gravity. To make the anti gravity machine even more powerful, the team used an oxygen and nitrogen mixture to create a paramagnetic fluid. Inside the magnet, the mixture helps the objects float. US space agency Nasa notified the team that it is interested in their zero gravity research. UFO buffs may recall a man named Bob Lazar [left] discussing a similar antigravity propulsion system over a decade ago, one that he said came from aliens. Lazar claimed to have worked as a physicist on a highly classified government project, called Galileo, which involved back engineering of alien technology. The research supposedly took place at a hidden base known only as S4, a few miles south of Area 51. At the time, Lazar said he and others were working on extraterrestrial craft hundreds of years in advance of modern technology. He also claimed to have seen a total of nine different types of saucers as well as documents and autopsies of alien corpses. The saucer-type he professed to have worked on had a diameter of 9-12 m with a console and small, children-sized seats. He said he was told the aliens arrived in the vessel from the fourth planet of the binary stellar system Zeta Reticuli 2. In "On the Record" with investigative reporter George Knapp, September 12, 1989, Lazar said the alien craft flew by amplifying gravity waves through use of a reactor and an alien element--atomic number 115--an ore not found or synthesized on earth. Lazar: Inside that tower is a chip of Element 115 they just put in there. That's a super-heavy element. The lid goes on top. And as far as any other of the workings of it, I really don't know, you know, [such as] what's inside the bottom of it . . . 115 sets up a gravitational field around the top. That little wave guide you saw being put on the top: it essentially siphons off the gravity wave, and that's later amplified in the lower portion of the craft. But just in general, the whole technology is virtually unknown. Knapp: Now we saw the model. We saw the pictures of it there. It looks really, really simple, almost too simple to actually do anything. Lazar: None detectable. Essentially, what the job was was to back- engineer everthing, where you have a finished product and to step backwards and find out how it was made or how it could be made with earthly materials. There hasn't been very much progress. Knapp: How long do you think they've had this technology up there? Lazar: It seems like quite a while, but I really don't know. Knapp: What could you do with an anti-matter generator? What does it do? Lazar: It converts anti-matter . . . It doesn't convert anti-matter! There's an annihilation reaction. It's an extremely powerful reaction, a hundred percent conversion of matter to energy, unlike a fission or fusion reaction which is somewhere around eight-tenths of one percent conversion of matter to energy. Knapp: How does it work? What starts the reaction going? Lazar: Really, once the 115 is put in, the reaction is initiated. Knapp: I don't understand. I mean, there's no button to push or anything? Lazar: No, there's no button to push or anything. Apparently, the 115 under bombardment with protons lets out an anti-matter particle. This anti-matter particle will react with any matter whatsoever, which I imagine there is some target system inside the reactor. This, in turn, releases heat, and somewhere within that system there is a one-hundred-percent- efficient thermionic generator, essentially a heat-to-electrical generator. Lazar: Well, that reactor serves two purposes; it provides a tremendous amount of electrical power, which is almost a by-product. The gravitational wave gets formed at the sphere, and that's through some action of the 115, and the exact action I don't think anyone really knows. The wave guide siphons off that gravity wave, and that's channeled above the top of the disk to the lower part where there are three gravity amplifiers, which amplify and direct that gravity wave. Knapp: In essence creating their own gravitational field. Lazar: Their own gravitational field. Knapp: You're fairly convinced that science on earth doesn't have this technology right now? We have it now at S-4, I guess, but we didn't create it? Knapp: Why not? Why couldn't we? Lazar: The technology's not even-we don't even know what gravity is! Knapp: Well, what is it? What have you learned about what gravity is? Lazar: Gravity is a wave. There are many different theories, wave included. It's been theorized that gravity is also particles, gravitons, which is also incorrect. But gravity is a wave. The basic wave they can actually tap off of an element: why that is I' m not exactly sure.